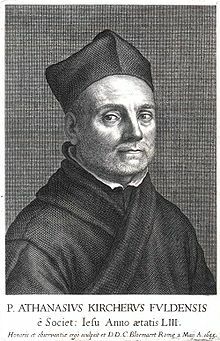 The prominent German Jesuit polymath Athanasius Kircher (1602-1680) (see biography of Athanasius Kircher) was a famous 17th century scholar, who published around 40 works, most notably in the fields of egyptology, music, optics, magnetism, geology, linguistics and comparative religion. Kircher's best-known work today is his Oedipus Aegyptiacus (1652-54), which was a vast study of Egyptology and comparative religion. His books, written in Latin (which was the common scientific language then), had a wide circulation in the 17th century, and they contributed to the dissemination of scientific information to a broader circle of readers. The name of Kircher is mentioned in other articles of this site—for Napier's Bones (concerning his Organum Mathematicum) and for his version of the Llullistic method. From 1638 onwards Kircher was professor in mathematics at the Collegium Romanum in Rome, and his interest covered everything under the sun, (it seems he was one of the latest Renaissance men). When he was released from teaching duties after 8 years, he started publishing books, concentrating on a different subject every three-four years. He received visits or letters from scientists, royalty and clergy from all over Europe and beyond, together with a multitude of artifacts, curiosities of natural history and mechanical apparatus, which he later, together with his huge library, donated to a museum, which eventually became the famous museum of the Roman College or Museum Kircherianum. This museum became one of the top attractions of Rome in the 17th century. Athanasius Kircher was also notable for his interest in automata, e.g. his plans for building a talking head and mechanical music-makers. There is a note from Edward Browne (1644-1708) who arrived in Rome in 1670s to visit Kircher, who showed him his closett of rarieties, which included a perpetual motion machine and a talking head. Kircher wanted to create a speaking statue for the visit of Queen Christina of Sweden to the Musaeum Kircherianum, a statue that will have to answer the questions that it is asked. Obviously the Kircher's interests in the field of automata began much earlier. 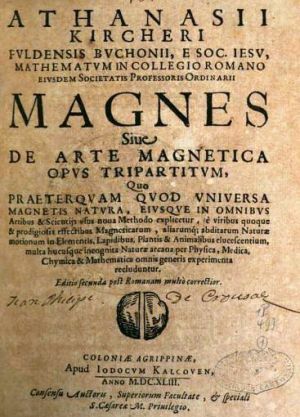 In his book Magne sive de Arte Magnetica (see the upper title page), published for the first time in 1641, he describes and illustrates several automata, which depend for their action upon magnetism and pneumatics. In Magne sive de Arte Magnetica Kircher gives a representation of an old automaton, commonly attributed to the Greek scientist Archytas of Tarentum (BC 428-BC 347) (who is believed to be the founder of mathematical mechanics and alleged inventor of the screw and the pulley), so called Dove of Archytas. It was reputed to be the first artificial, self-propelled flying device, set in motion by a jet of what was probably steam, said to have actually flown some 200 meters. According to another story, the Dove was put in action by a revolving loadstone and was made to fly around a dial and mark the hours by pointing to the figures on its edge. 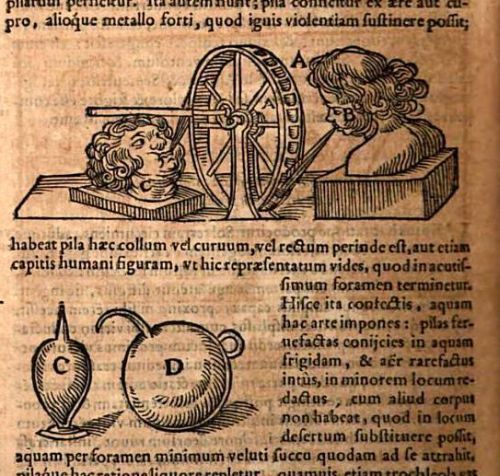 On the lower illustration can be seen a wheel, driven by 2 Eolipiles in the form of human heads, which blow out jets of steam against the cellular periphery of the wheel. The little boilers (marked C and D), hidden in the heads, are illustrated in the lower part of the page. Athanasius Kircher was also one of the first people, who described the mechanical organ utilizing the pinned barrel (although the hydraulic organ had been well known since the time of Ctesibius). 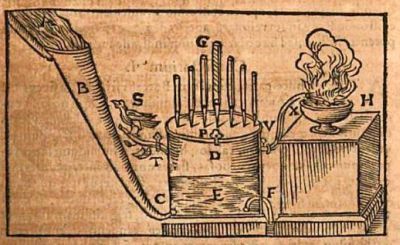 Kircher described also "the automatic organ machine which utters the voices of animals and birds" in which a satyr played a short piece on the pan pipes, to which a nymph replied, like an echo, with a melody played upon a small organ. Kircher also devised a hydraulic machine to represent the Resurrection of the Savior and another device to exhibit Christ walking on water, and bringing help to Peter who is gradually sinking, by a magnetic trick. This device featured a strong magnet placed in Peter's chest and the steel out of which were wrought Christ's outstretched hands or any part of his toga turned toward Peter. The two figures, propped on corks in a pool of water, would then be drawn inexorably together: the iron hands of Christ soon feel the magnetic power diffused from the breast of Peter. The artifice will be greater if the statue of Christ is flexible in its middle, for in this way it will bend itself, to the great admiration and piety of the spectators.